It’s time to be thinking about Easter! And Easter reminds me of… eggs! And I have a “thing” for easter eggs! They are so much fun to dye and to decorate with. So today, I want to inspire you to think about gorgeous Easter eggs. I’m sharing a couple natural ways to beautifully dye eggs and a really fun, easy way to decorate eggs using torn tissue napkins. If you love vignettes and tablescapes you can also see those too! Today is an Easter Egg-stravaganza, here at StoneGable! 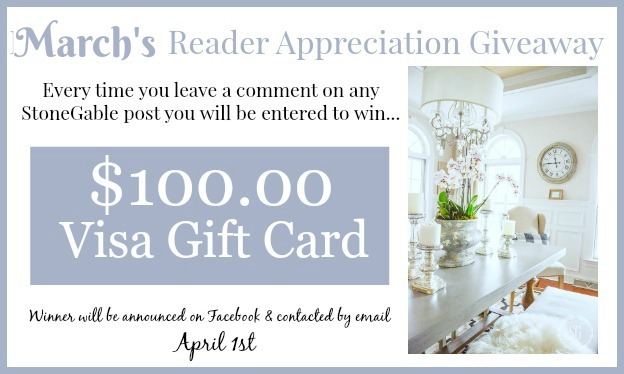 Make sure to comment to enter to win! Are you enjoying our new podcast DECORATING TIPS AND TRICKS? We are having a blast and we have lots and lots of tips to share with you! Today we have a new episode, WHAT’S IN YOUR DECORATING TOOLBOX. Such practical information. We are sharing all the things you might need to hang, glue, staple, saw, sand, putty and more in your home! Come hear my top 3 tools I love the best and how my little dog Scamp sold me on Gorilla Glue!!!! You can listen to episode #19 below or listen to all the podcast episodes and get the show notes and any links to what we are sharing HERE. Don’t forget to take us on the go with you too! You can listen while exercising, walking the dog, driving in the car, grocery shopping… Anywhere you are we can be there too. You can find DECORATING TIPS AND TRICKS on your iPhone or Android app. Let’s talk Easter Egg Egg-stravaganza! If you like eggs you will love this table. There are eggs in nests and eggs as a centerpiece. This is such a pretty and light table! 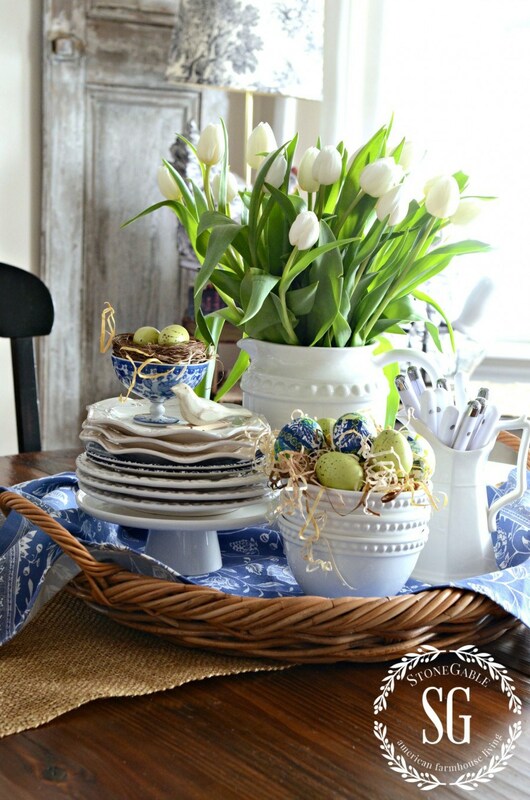 I bet you can find lots of ideas to use on your Easter table here! I make these gorgeous dyed onion skin eggs every year! They are a part of our family tradition. I made them with my grandmother and I’m sure she made them with her’s. The gorgeous variegated orange colors and swirls the onion skins create on each individual eggs are like little works of art! One of my favorite things to decorate is my breakfast nook table. And every spring I try to create something new. The colorful green, white and blue eggs are made out of torn napkin tissue. You can read about the technique below. Creating a kitchen vignette is such an easy way to bring the season to your home! Aren’t these just the sweetest? And how pretty would they look gracing your Easter table? Come see just how easy they are to make. When you are finished with them indoors just crack the egg in your palm and plant it right into the ground! Aren’t these so so pretty? Even if you are not crafty you can make them. I used blown out real eggs and covered them with torn out areas of a napkin. Just think of all the charming eggs you could make. You are only limited by the designs on the napkins you find! Another vignette to inspire you. There is something about this creamsicle colored vignette I love! It’s so happy and bright! Why don’t you gather up some same colored items to make an Egg-elent vignette! Have you ever tried to dye Easter eggs using food? 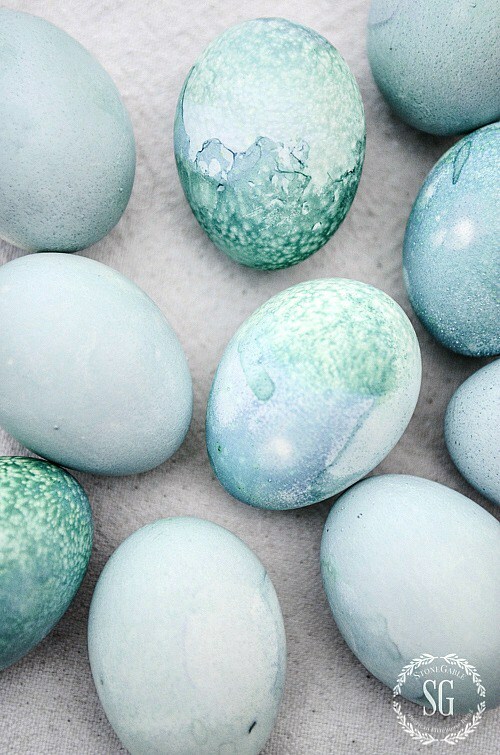 These gorgeous blue eggs were dyed with red cabbage. Yup! These eggs were so easy to dye and I think they are the most beautiful eggs I have every made! My family loved them! Another vignette with eggs. What can I say? 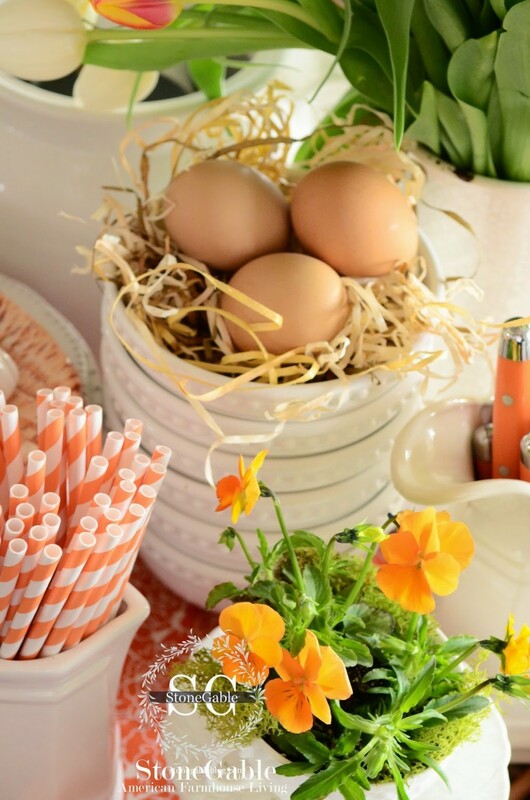 It just wouldn’t be spring and Easter around here without an egg filled vignette on the kitchen table! This little arrangement took only minutes to put together! I made two and used them as a centerpiece for my Easter table! They are such a breath of fresh spring air!!!! You CAN do this! 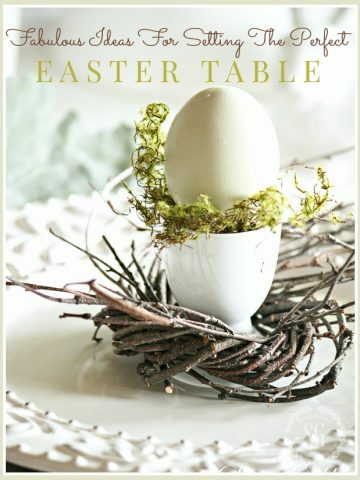 I hope one of these egg-specially springlike egg projects have inspired you!!!! It’s not too early to start planning for Easter! 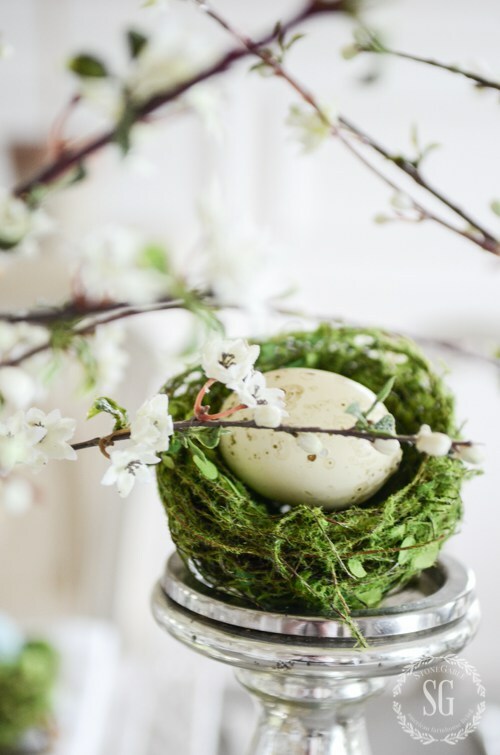 Do you have a special way you use Easter eggs in home decor? I’d love you to share! You might like to follow me on Pinterest and see all the things I’m finding to pin every day HERE. Yvonne I have followed you for a long time. Yours is my favorite decor site. I think that you are so talented. The tone of your site is friendly, charming and your style is at the same time both luxurious and cozy. You have great enthusiasm and you are a great teacher/coach . Thank you for being there! Andrea! Did you just make my day?????? Thank you so so much! I am enjoying all the different types of Easter eggs in using different things to dye the eggs. Yvonne, so many gorgeous ideas. Love blue and white. Beautiful vignettes. Happy Spring to you and your family. This year I went with non store bought eggs in colors of blue and tan for my decor. My boss raises chickens and he brought me quite a few eggs. I blew out the inside and we ate scrambled eggs for days – even my dogs had eggs! Now I think I might mix in some tissue paper eggs as well. Thanks for the how too on all the eggs. Such wonderful ideas. Thank you. I have a “thing” for Easter eggs too! A friend just showed me how to use men’s old silk ties to dye eggs using vinegar- the pattern transfers to the eggs- going to try your book page and torn napkins ones too- so pretty and creative! Yvonne, what beautiful egg vignettes you’ve created! 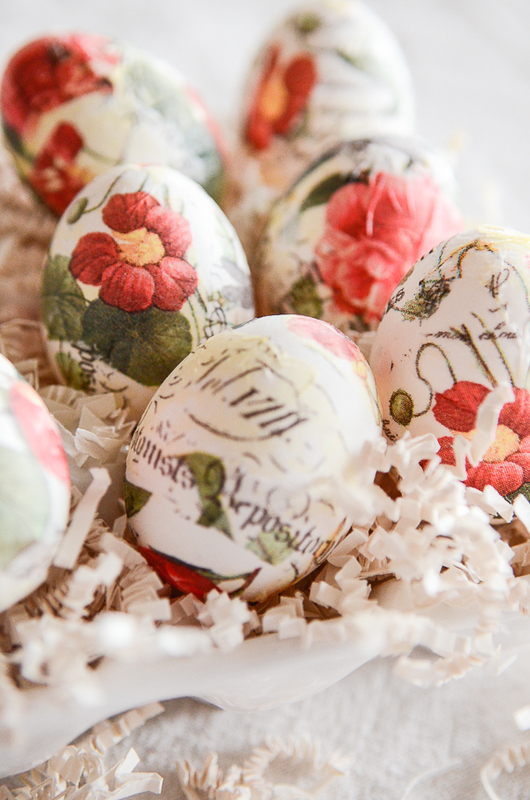 I especially love the red cabbage dyed eggs and the torn napkin decorated eggs. Love the blue and white with the green eggs. Lovely and makes me happy. Thanks for sharing. 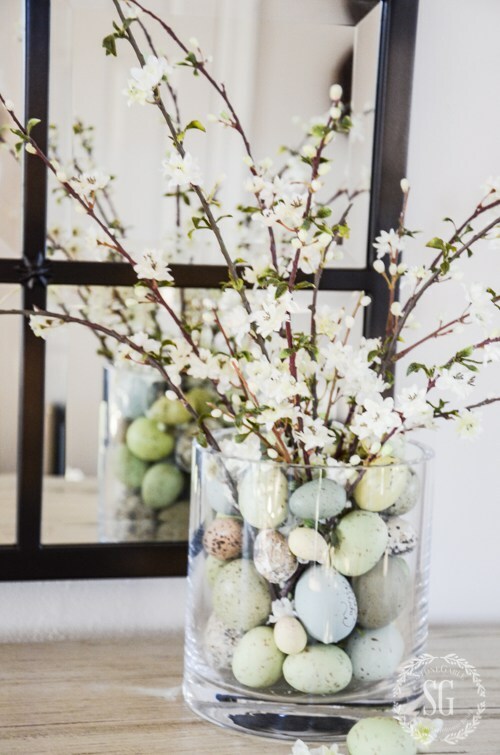 I like them all but my favorites are the blue and white eggs made using napkins and the clear vases filled with Easter eggs and apple blossoms. The table settings are all so pretty. Absolutely beautiful! Love the blue eggs. Everything is so colorful. Love all the ideas. I am going to try some. My boys are grown but these ideas make me want to dye Easter eggs again! Thanks for the ideas. Everything on your blog is just beautiful! Love the blue eggs too! 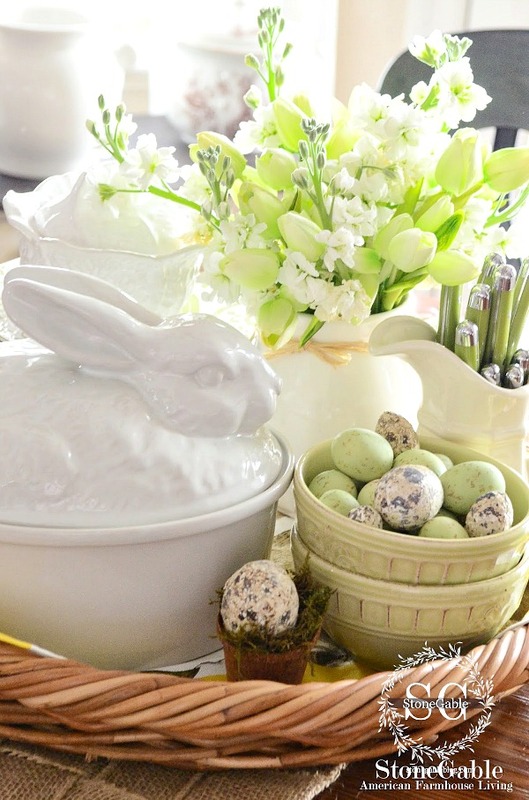 I love the white bunny tureen. At least I think he may be a soup tureen? I like that you have several colored handled cutlery, the green is very soothing. I need to add that to my arsenal of tableware goods. So fun! Now to decide which ones to try! Thank you for the ideas! I love all the pretty eggs. All the colors and all the ways you have decorated with them. So ready for Spring ! Onion skins and purple cabbage how fun .. gotta try it! Thank you for sharing all the great Easter ideas. I love the blue eggs most of all! There is just something about them that speaks to me. Definitely going to try them! Are all the eggs in your hurricane centerpiece blown shells? I love that look! Hi Bonnie, No, they are faux eggs I found at a local decor store. Those blue eggs are breath taking!! So beautiful! Directions, please!! Hi Cheryl, click on the title for the blue eggs and it will take you to the the post with all the directions on it. The blue eggs are my favorite. I noticed the lovely pansies. I hope to buy some for my front lawn when they come out in my store. Every one of those eggs are so pretty. All of those eggs are gorgeous. Thanks for sharing. Much thanks for all your lovely ideas and kind words! Beautiful! I also make colored eggs using onion skins, this year I am going to try the purple cabbage. The colors are gorgeous. You’ve inspired me with those beautiful eggs. But then again — your blog and pod posts inspire me all the time. So much beautiful inspiration….i kind of feel like a slacker. I need to get my act together and get some spring/easter decor out. 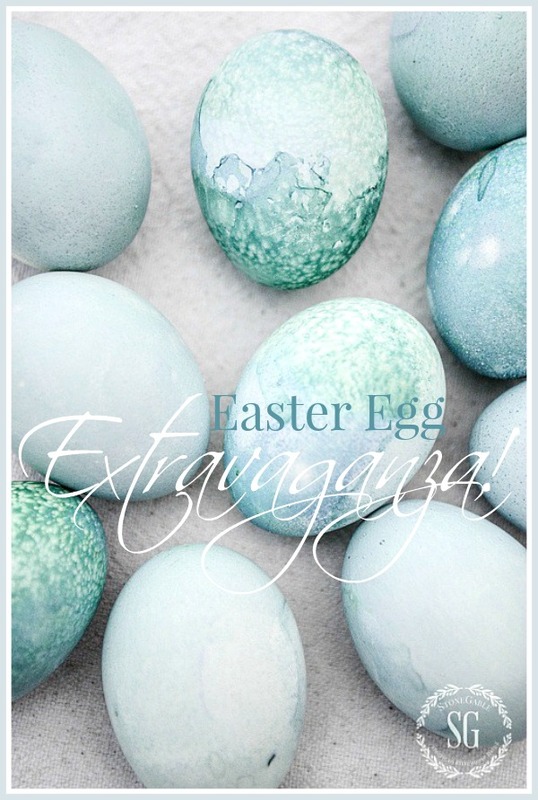 Those cabbage dyed eggs are so gorgeous! So beautiful and inspiring! Thank you for sharing your talents! I love the “Blue Cabbage Eggs”! I will be trying this project for the Easter Holiday. What beautiful ideas – thanks for the post! Beet juice makes beautiful combinations of red to pink eggs. Very egg-cited to try the different techniques of dying easter eggs. Thanks for the inspiration…I’ll be dying eggs with the grandchildren in the near future. Have a great day! This is the best post I’ve ever read about decorating ideas for eggs. I never knew you could get such lovely effects with onions, cabbage and napkins! I am fascinated with all your kitchen vignettes! They are all beautiful! Just love your ideas. Thank you! The eggs are all so beautiful. 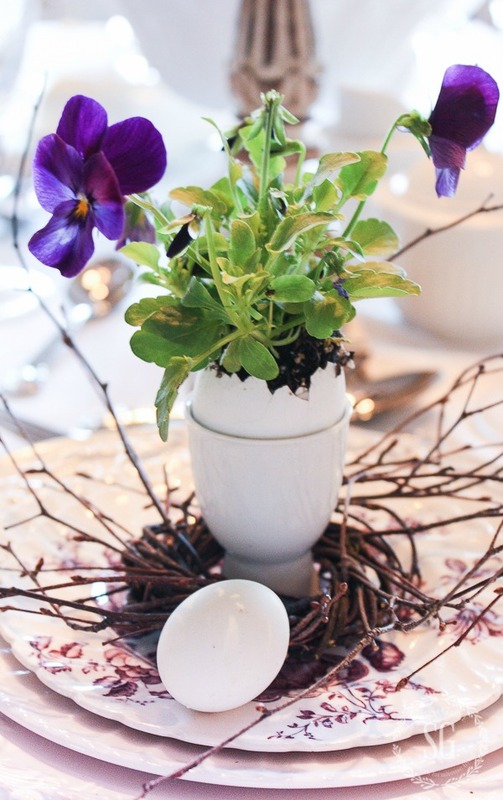 I love the idea of the pansies in an egg shell. You are just so creative! I love that red cabbage makes blue eggs! I wonder what beets would do??!! Yes, they make very pretty pink eggs! I haven’t done eggs in years, but you have inspired me (once again)! last year you inspired me with your tissue eggs post. Even tho I couldn’t find the pretty paper that you used I was very pleased how mine turned out. Thank you for all you do-❤your blog. LOVE the pansies in egg. I’m going to do that for Easter and blue eggs too. Grandkids love to dye eggs at any time of year! I love the naturally dyed blue eggs!!! Beautiful! So beautiful -love your spring displays! I love the blue eggs made from red cabbage! I will try these with my grandchildren! 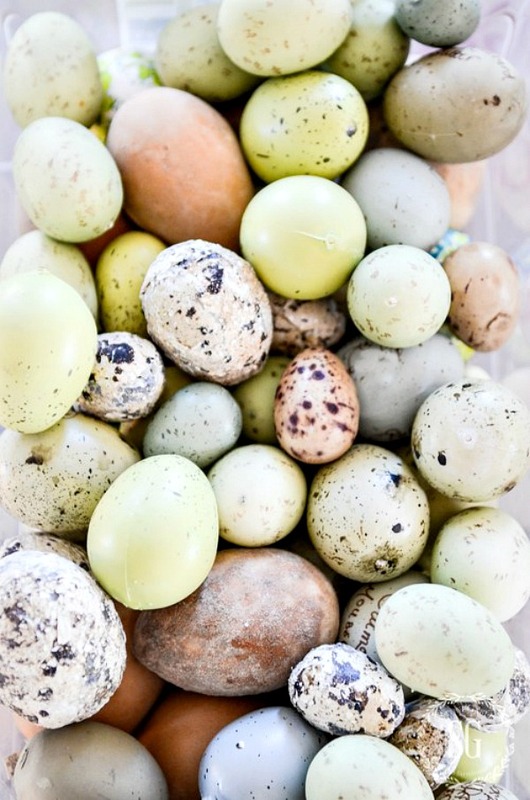 Have you ever figured out a way to replicate the quail eggs? Over the years many of your readers have inquired where you purchased them. I’m thinking, if that source is not available, perhaps it’s time you challenged your readers to come up with a DIY! Hi Teddee, the eggs were given to me. I don’t have a source. Too bad, they were adorable! Your egg designs are egg-cellent. Sorry I had to do it! Have never seen the multi color eggs. You just transplant seedling viola inot egg shell? Yes Barbara. Read the post it has a complete tutorial to help you. The Blue Eggs are so unique and will surely go well in my Kitchen. Red Cabbage, who would have thought~ Thanks for sharing such great ideas!! Love all your ideas. We also use onion skins, and walnuts shells to dye our Easter eggs. They are a beautiful mix of browns and tans. I listen to your podcast each morning at work. They make me smile and laugh a lot. Thank you. So glad you are enjoying the podcast! How inspiring. Love all the beautiful colors. Love all the colorful eggs. My mother always make eggs with onion skins and I’m going to try them this year using your directions. Love the eggs! Thanks for the inspiration. I love the Easter Eggs and combining them with flowers. Thank you for the ideas. Love the entire article on Easter Eggs. Going to try some this coming weekend with Neice and Nephew. Love them all…surprised about the red cabbage! 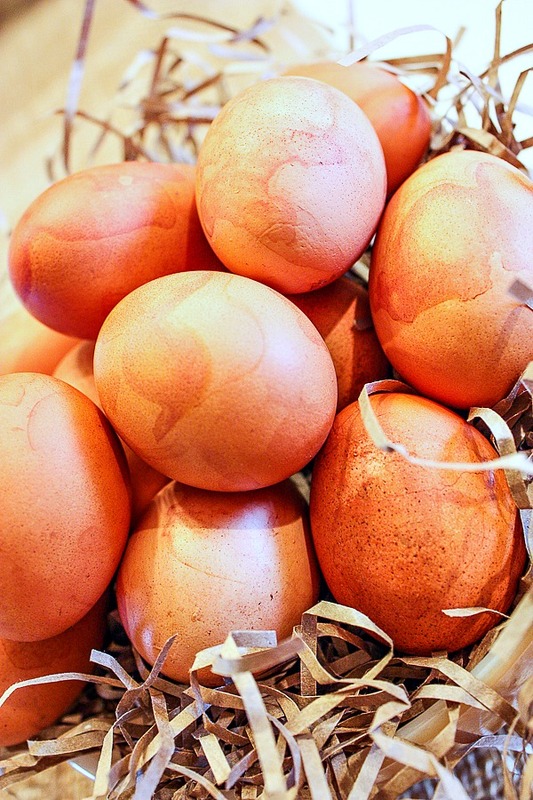 great ideas for “natural” dyes for eggs …thanks! 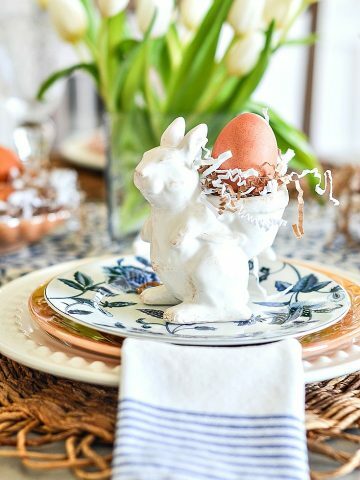 I love all of your great Easter Egg ideas….especially the pretty vignettes using your fabulous dishes. Those are always my favorite! Looking forward to decorating for Easter! Blessings to you…. I made the tissue eggs last year and I just love them. I think I will try the onion skin dyed eggs this year. They are so much fun to do. Memories of Gramma, the onion skin dyed eggs. Those were always in my Easter basket as a child. Thanks for sharing! Those blue eggs are exquisite. Definately going to try the red cabbage technique. I love all these ideas and vignettes. Especially like the blue and white kitchen table vignette. Thanks for the inspiration. I love the pansie in the eggshell! Love everything especially the tissue covered eggs. What a wonderful variety of Easter egg ideas! It’s impossible to pick my favorite. 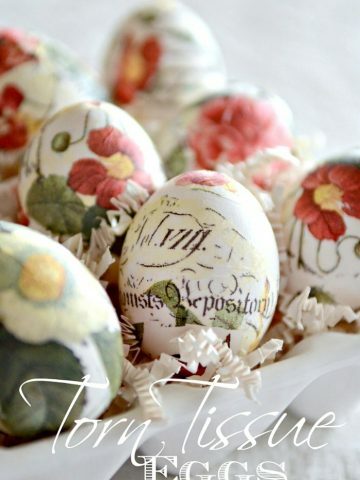 Made your napkin decoupage eggs last year and loved them! Will try dying with red cabbage next! I love your torn tissue eggs. I have made these after following your instructions and can’t wait to display them again!! The napkin colored eggs are stunning! Every one is beautiful, thank you!!!!! 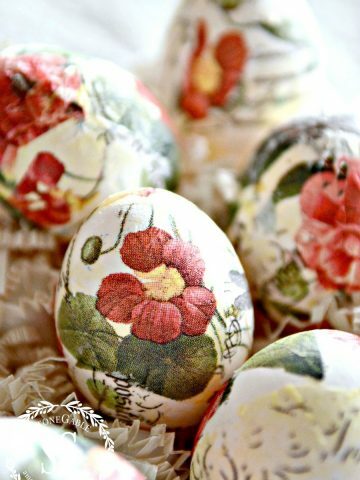 I love the pansies in the egg shells…..way too cute….Thanks for such lovely eye candy on your egg treasures!! I did some last year and now looking at them again I have to do more. Thanks for all the ideas. Love all of the different colors. Thank you for the ideas. Wow! So many great egg ideas! 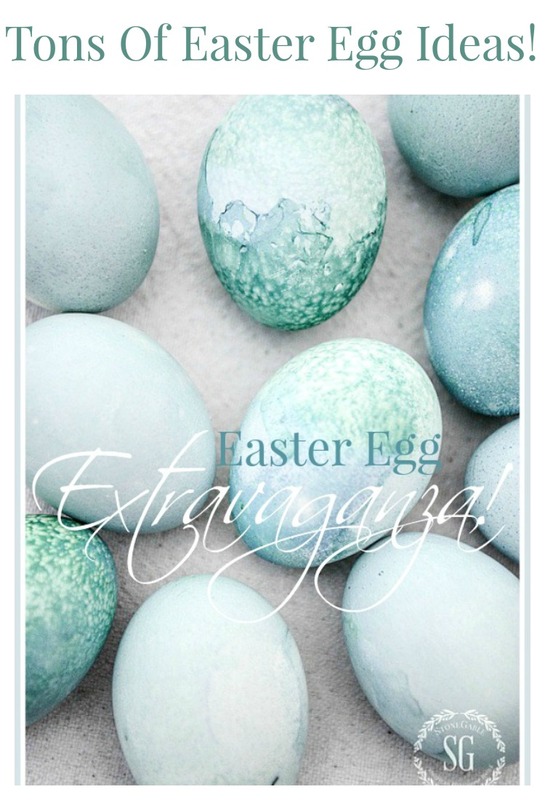 I usually resort to the pale speckled faux eggs for my decorating but would love to try one of these! Thank you! Those pansies…..and the cabbage died eggs!! Love them! Thank you for the inspiration! I love the blue and white kitchen table vinnette. Also the pansy in the egg shell. Thanks for sharing. Love the naturally colored eggs!